The Terrex 2 infantry fighting vehicle is developed by ST Kinetics. Photo: Business Wire. Terrex infantry carrier vehicle served as the basis for the new vehicle. Image courtesy of Limkopi. The Terrex 2 combat vehicle is equipped with Allison 4500 SP transmission system. Image courtesy of NEUREUTER FAIR MEDIA GmbH. Terrex 2 is a fully amphibious, wheeled, armoured vehicle designed and developed by Singapore’s ST Kinetics for armed forces in both littoral and land-based missions. It is an enhanced version of Terrex armoured vehicle, which has been operational with the Singapore Armed Forces since 2010. The primary role of Terrex 2 is to transport troops/combat engineers to the battlefield with increased ballistic/blast protection. The vehicle can be configured as an armoured engineer vehicle, command and ambulance. Terrex 2 was unveiled at the DSEI (Defence and Security Equipment International) exhibition held in London, UK, in September 2015. 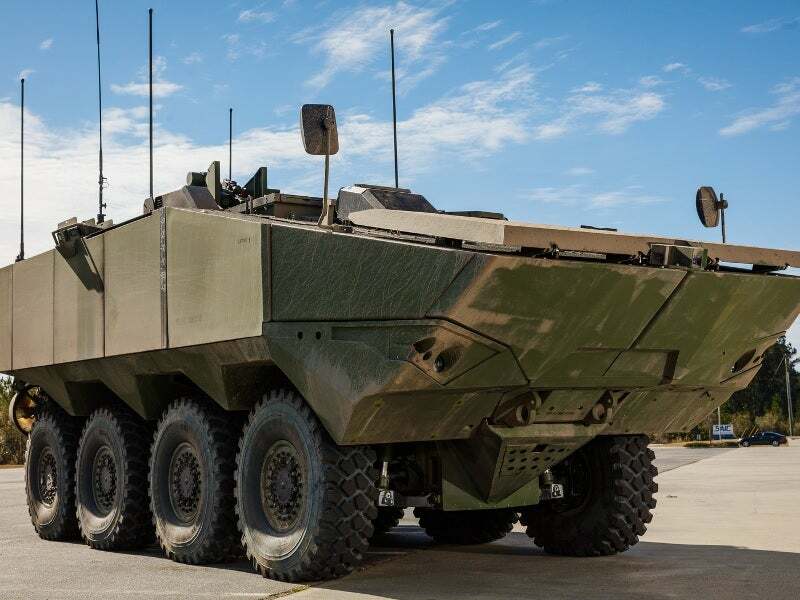 The Terrex 2 troop carrier platform is being offered by ST Kinetics and its US partner, Science Applications International Corporation (SAIC), for the US Marine Corps’ (USMC) Amphibious Combat Vehicle 1.1 (ACV 1.1) programme. The ACV 1.1 solution is intended to transport embarked marine forces from ship to shore with superior mobility. SAIC won a $121.5m contract from the USMC in November 2015 to build Terrex 2 prototypes for the engineering, manufacturing and development (EMD) phase of the ACV 1.1 programme. The first of 16 prototypes was delivered to the USMC in February 2017. Based on an 8×8 protected wheeled platform, the Terrex 2 infantry fighting vehicle features V-over-V (VoV) hull, which is made of steel armour. It can be operated from L-Class ships and surface connectors. The vehicle is 8m-long, 3.6m-wide and 2.8m high and has a turning circle diameter of 17m. Its gross weight and payload capacities are 30,000kg and 9,000kg respectively. The Terrex 2 troop carrier variant is manned by two crew members, a driver and a commander, and can transport up to 12 fully equipped troops. The driver’s seat is placed on the left side of the hull with the commander seat behind him. The infantrymen are seated in the troop compartment, which is fitted with a power-operated ramp at the rear. "The primary role of Terrex 2 is to transport troops/combat engineers to the battlefield with increased ballistic/blast protection." The armoured engineer variant comes with a push barrier at its front to perform obstacle clearing tasks. The ambulance variant is integrated with lift support equipment and stretcher loading equipment for casualty evacuation. A remote-controlled weapon station featuring four smoke grenade launchers on either side can be mounted on the vehicle’s roof to provide defence against enemy targets. The turret can be armed with a .50 calibre machine gun or a 30mm automatic cannon to engage armoured vehicles, personnel, missiles, rockets and heavy machine guns. The vehicle’s VoV hull offers increased ballistic protection from small arms and shell splinters. The blast-mitigating seats provide high level of protection against mine and improvised explosive device (IED) blasts, up to STANAG 4569 standard. Additional armour plates can be installed on the hull for improved crew survivability. With hatch closed, the driver looks through three vision blocks in cupola. The vehicle commander and gunners have panoramic day/night stabilised sights. Up to ten fusion cameras located on the vehicle’s hull provide operators with all-round situational awareness both during the day and night. The Terrex 2 is outfitted with sensors and C4ISR (command, control, communications, computers, intelligence, surveillance and reconnaissance) suite for command and control. Power for the Terrex 2 infantry fighting vehicle comes from a forward-mounted Caterpillar C9.3 engine, which develops 600hp of power and 1,900nm of torque. The engine is coupled to an Allison 4500 SP transmission system with six forward gears and one reverse gear. Hydrostrut-supported double wishbone suspension is provided on all wheels to deliver superior manoeuvrability on rugged terrain conditions and urban areas. The vehicle’s amphibious operation is enabled by a pair of propellers fitted one on either side of the hull at the rear. The propellers are driven by a hydraulic motor, which is controlled by a full-authority digital engine control system. The vehicle also incorporates hybrid all-wheel steering and hydraulic dual-circuit brakes with an anti-lock braking system (ABS) for control on off-road surfaces. The vehicle’s mobility can be further increased with the addition of skid steering and off-road tires with central tire inflation system. The Terrex 2 wheeled combat vehicle offers a maximum speed of more than 90km/h on roads and 11km/h in water. It can travel up to a distance of 600km, and climb grades of 60% and side slopes of 30%. The vehicle’s approach and departure angles are 40° each. The Terrex 2 can ford in 2m-deep waters and cross obstacles up to 2m-high. It is survivable in rough waters in Sea State 3 conditions and a 6ft plunging surf. ST Electronics (Info-Comm Systems) provides leading C4I solutions which empower commanders with unrivalled superiority in situational awareness and decision-making for missions.